This year’s Founders Week theme pays tribute to the women of Campbell, from the founding first lady, Cornelia Pearson Campbell, to the students, faculty and staff leaders of today. We honor their servant leadership, strength, and unwavering commitment to the University and the lasting impact they have made across generations. Today we honor Campbell’s female athletes from the past and present. We asked MacKenzie Koeller (’18, ’18B), Sabina Allen (’18), Erin Scott and Lauren McNamara-Clement a series of questions about their Campbell experience and how it has helped them in #LeadingwithPurpose. 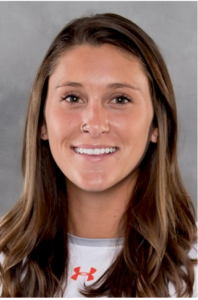 MacKenzie Koeller (’18, ’18B), filled her four years as a member of Campbell’s Women’s Lacrosse team, Fellowship of Christian Athletes, the Student-Athlete Advisory Committee, work with Spiritual Life and numerous honor societies. Now residing in her hometown of Cary, Koeller has a full-time position with LORD Corporation, where she is a part of their Career Foundations program. I love the company I work for now. It has its global headquarters in Cary, but has offices in 27 different countries. I’m able to travel all around the globe as part of my job, so I can’t imagine working anywhere else. However, in the long-term, I would like to continue working for the Fellowship of Christian Athletes lacrosse ministry, either full or part-time. Who helped you the most as you prepared for life after graduation? The professors at Campbell were the ones that prepared me most for my current career. I’m able to apply what I learned in the classrooms at Campbell, but the professors helped me most outside of classroom walls as well. The unique thing about Campbell is that the class sizes are so small that my professors knew my name and knew who I was. So, I could stop by any given professor’s office at any given time to ask questions about school, careers, or general questions about being an adult. Those candid conversations and the advice those professors gave me were what prepared me for life after college. What did you learn through your time on the lacrosse field? Being a part of the women’s lacrosse team was a huge highlight of my time at Campbell. I have never been so close with a group of girls, and probably never will be again. I learned that no one can dictate how hard I work; it’s a decision I must make for myself. I learned how to use failure as a motivational tool and how to rejoice in the success of my teammates. Most of all, I learned to humble myself—stepping out on that field daily revealed so many of my physical and mental weaknesses. What is one piece of advice you would give to incoming or current Campbell students? Just do something. I understand that college can be terrifying because there is so much pressure placed on you. People are asking you to make decisions about the rest of your life when you’re twenty years old. The stress can be crippling, but don’t allow the pressure of the world to paralyze you with fear. Don’t spend four years wandering around aimlessly trying to “find yourself.” If freshman year you feel called to business, then find a business internship and go for it with all your heart. If you find you don’t like business, then try science. Or the arts. Or humanities. If you don’t take advantage of the opportunities that present themselves to you in college, you’ll look back and wonder what you accomplished over the past four years. 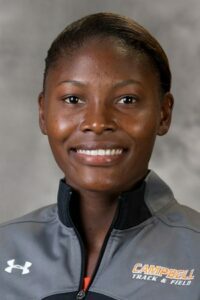 Sabina Allen (’18) was a Campbell Track & Field star at Campbell University, holding the titles of Two-Time All-America, Twelve-Time Big South Individual Champion, and Big South Women’s Field Athlete of the Year (2018) to name a few of her awards. Allen, a Criminal Justice major with Political Science minor, is currently working at a law firm, with hopes of going to law school in the near future. Servant leadership depicts that a leader must initially be a servant to others. In order to be productive, a servant leader must put the needs of others before his or her own. How did you balance being a team player with being a leader in track & field? I always encouraged and supported my teammates. I listened to their opinions and helped them whenever I could. I led by example, for instance, showing up on time and being resilient and tenacious in practice. I think being a leader with being a team player occurred simultaneously. Were there any professors who inspired you to be a better leader? I learned a lot about being a leader from Dr. Cowling (professor of Criminal Justice) and Coach Harris (assistant track and field coach). I learned to not be afraid of taking control and stepping up, whether it be on the track or otherwise. What quality should ever leader possess? I think every leader should possess empathy. Erin Scott is a current senior from Texas who quickly found her home at Campbell after transferring in after her sophomore year. 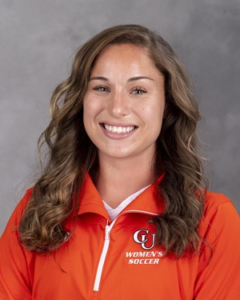 Scott is currently serving as the executive vice president of Campbell’s Student Government Association (SGA), and plays goalkeeper as part of the Campbell Women’s Soccer team. Scott, a double major in broadcast & electronic media and sports communication, wants to create more inclusivity between Campbell students and student athletes. What does it mean to you to be a leader on the soccer field? How do you balance being a leader with being a team player? I think that one thing I try to do is lead by example. It’s really easy to tell someone “hey, do this,” but when someone sees you doing that, or going the extra mile, or making sure someone is okay, that really means a lot. Sometimes just telling someone that they’re doing well means a lot because athletics can be hard and we’re always looking for what we’re not doing right. It goes back to making sure that what I’m doing reflects what I’m saying. How do you use your abilities in soccer to make a difference for SGA? In SGA, we are interested in making sure that we aren’t isolating athletes but rather connecting them. By reaching out to athletes specifically, it really alleviates that boundary between the “regular student” and the student athlete. Athletes isolate themselves without even knowing it, because they sit with their teammates in class or at games, so trying to merge SGA events on campus with athletics is really important. And it just so happens that i’m an athlete, so it worked out well. When soccer is in season, it’s a lot of trying to make sure I’m ahead on my work. When we’re on the road and I have to miss class, I’ve tried to look at that as a good opportunity because I’m stuck on a bus for five hours and it forces me to get that paper or that assignment done. I try to make sure that when I’m in meetings I’m fully there and present and not thinking about something else. I also compartmentalize my life, so that when I’m doing soccer, I’m not worrying about homework and when I’m doing homework I’m not worrying about how the season is going. If I’m doing my best in each individual part of my life, the work is going to reflect that. Are there any faculty or staff members who you view as an example of excellent leadership? I would say my coaching staff as a whole has gone about leadership by making sure that we all feel cared about and like we have someone to go to. I think that’s a really important part. Another example is Dr. Farmer in the communications department. I will never forget one day I ran out of class because I was so sick, and Dr. Farmer went out of his way that afternoon to email me and make sure I was okay. He doesn’t need to be that too assertive leader and tell you what to do and how to do it because he leads by example. His classes are hard but he cares about you and wants to see you succeed. I think it’s really important to make sure that the people who look up to you as a leader know that you care about them. What is one characteristic that every leader should have? Every leader should be humble. I think humility is really important because you couldn’t get to where you are without the people around you. What would you say to a student who wants to be involved and wants to be a leader but is too nervous to take that first step? It’s really just putting yourself out there and finding those people who will help you succeed. I wouldn’t be involved in SGA without Brendi Bluitt (SGA executive president). The girls on my team have supported me and never said, “hey, you don’t have time for that” or “that’s not smart, what are you doing?” Everyone was immediately supportive of me wanting to get involved. It’s all about surrounding yourself with those people who are going to help you reach your goals. 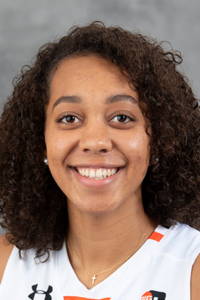 Lauren McNamara-Clement is a current sophomore psychology major from Raleigh, a member of the Campbell Women’s Basketball team, and is involved with Spiritual Life at Campbell. She is the community service representative for the Student-Athlete Advisory Committee (SAAC), is involved with Hope Happens Here, a student-athlete organization focused on breaking stigmas of mental health in student-athletes, and Number One Fan, a Spiritual Life initiative that supports and advocates for student-athletes. What does being a servant leader mean to you? I try to live my life by doing things for others, not because I feel the need to do them, but because I find so much joy in it. I truly believe I am called to serve others, and that’s what helps me find my purpose. I think when you lead you have to do it out of your heart and not for the title or because you want recognition, but because you truly desire in your heart to serve. How do balance being a team player with being a leader in your sport? One of the biggest things I’ve realized after my freshman year is that when you’re on a team and you want to lead, it can be challenging to find that balance between being a leader and being a teammate. I think that being a leader is being with your teammates and acting as one of your teammates, but leading by example. You can’t look down upon them – you want to be one with the people you’re leading. I think in any leadership role when you’re trying to guide people, you have to place yourself on their level and be one with them, and that helps you relate to them and them relate to you. Are there any staff members who have helped you become a better leader? I would say Spiritual Life as a whole. This past summer I worked with CYTI (Campbell Youth Theological Institute), so I think just having that Spiritual Life component has helped me grow as a person. I think that what’s super neat at Campbell and what makes Campbell stand apart from a lot of other universities is having that spiritual life component and allowing me to be an athlete and be involved, because those are two very key important factors in the person I become. I use an agenda, which helps tremendously. I am very big on living day to day. Whatever gets done, gets done, and whatever doesn’t get done goes to the next day for me to finish. I try not to stress myself out about the things I can’t control, but know that if I’m doing my best effort, it will all work out. What advice would you give to a student who wanted to be involved? Just try to find one person to help you because that person will lead you to finding other people. I became friends with one person in Spiritual Life, and that person was able to lead me to others. It takes time, and it can feel like you’re not going anywhere, but if you just try to focus on building relationships, eventually they will grow. I truly believe that if one is able to love, that is the most beneficial quality. Love shows that you truly care about the person. If someone knows you care about them and you’re loved by them, they’re more willing to listen to what you have to say and learn from you.